The ultimate fall salad! 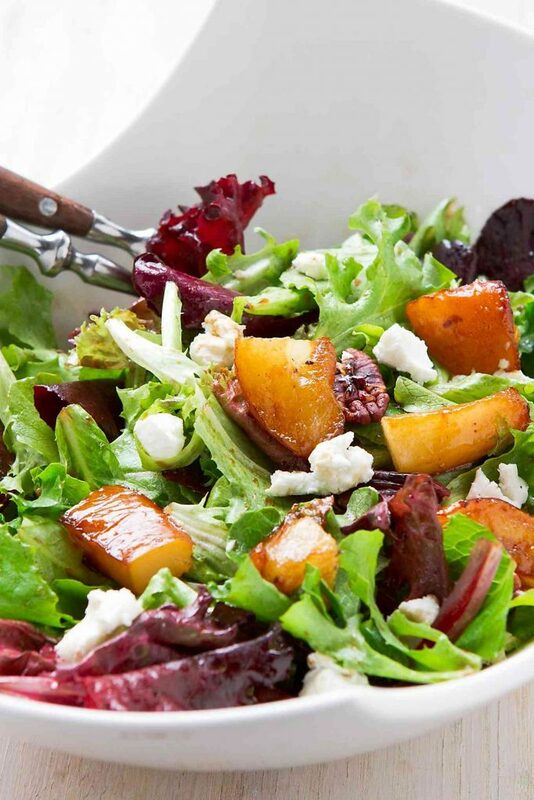 Maple glazed pears, toasted pecans & mixed greens come together in this goat cheese salad. Perfect combo of sweet and savory! You know you’ve hit the salad jackpot when your 16-year old son stands at the kitchen counter after dinner, eating up every last bite of the leftover salad. The boy loves anything to do with pears, which definitely tipped the scales in favor of this goat cheese salad. However, he always swore that green salads with goat cheese or, really, any recipes with goat cheese weren’t really his thing. But after he finished polishing off the salad, he asked, “What was that cheese? It was so good.” The boy is sold and there’s no doubt that this salad will be a repeat. Over and over and over again. 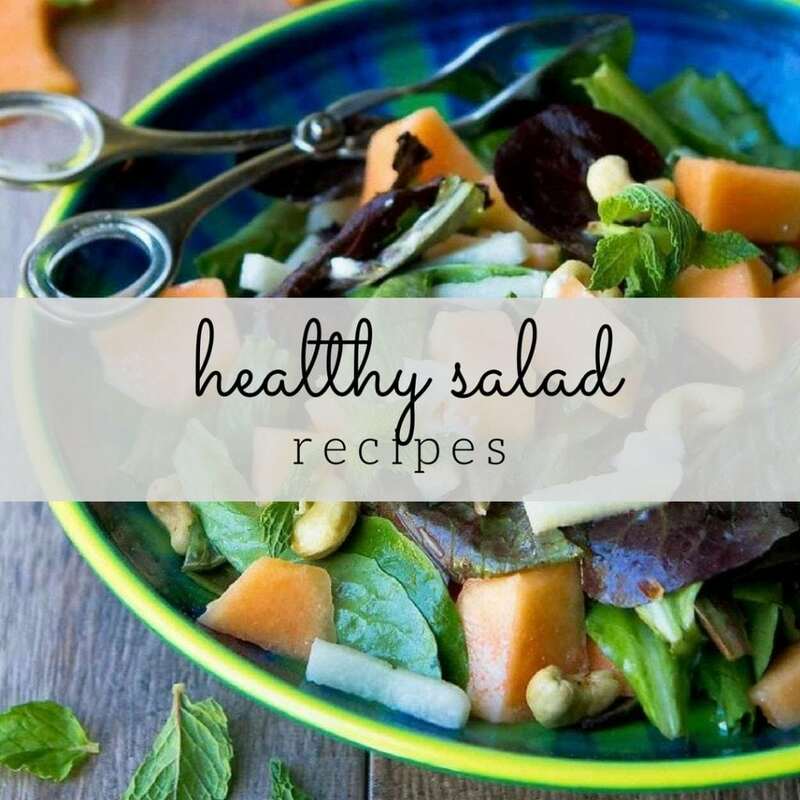 This salad comes together in just 15 minutes, making it a fantastic option for a weeknight meal or entertaining. Start by quartering and coring a couple of pears, then tossing them with a little maple syrup (not the fake stuff, I beg of you), salt and pepper. Next, brown them in a hot pan with some olive oil and glaze with balsamic vinegar. 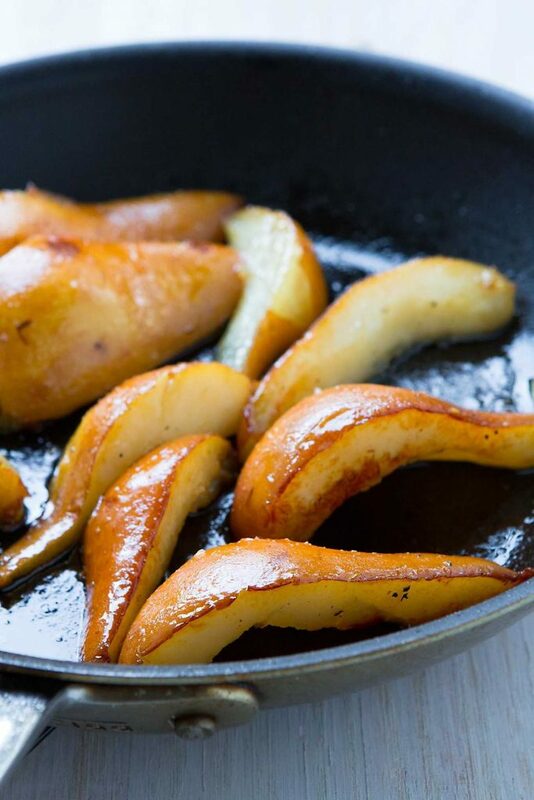 Let the golden brown pears cool while you’re putting together the rest of the salad, then cut them into bite-sized pieces before adding to the salad. 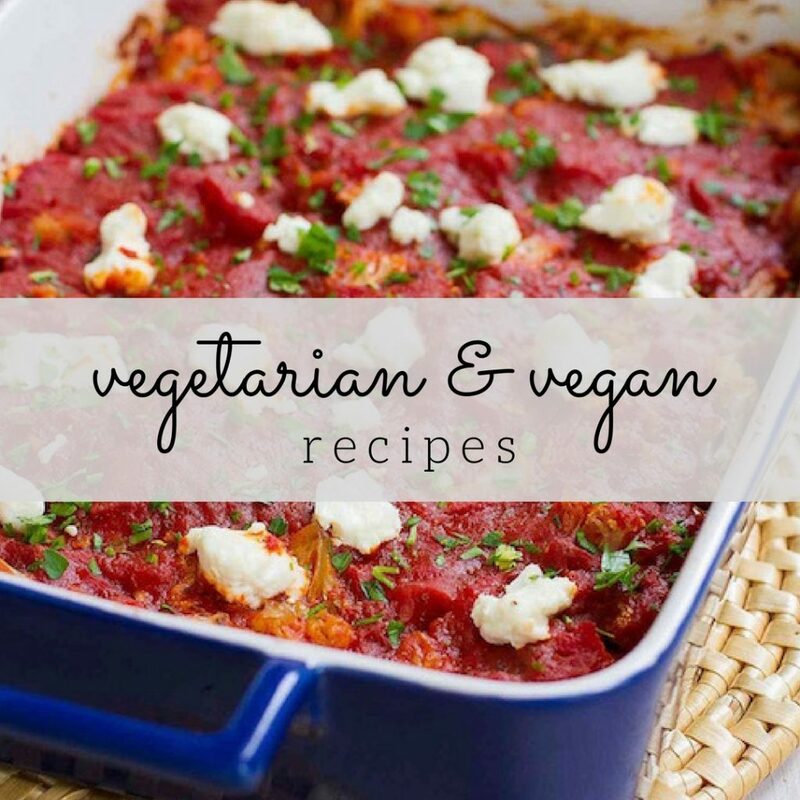 The rest of the salad is even easier. Combine some mixed greens, crumbled goat cheese and toasted pecans (toasted for a few minutes in a skillet set over medium heat) in a serving bowl. Whip up a simple balsamic vinaigrette – 30 seconds to make and so much better than store-bought! Then toss it all together with the sautéed pears. This side salad could easily be made into a dinner salad with the addition of cooked chicken or seared shrimp. I would suggest doubling the salad ingredients if serving this as an entree for four people. Place the pear quarters in a bowl and toss with the maple syrup, salt and pepper until coated. Heat the olive oil in a small nonstick skillet set over medium-high heat. Add the pears, one cut side down and cook until browned, about 3 minutes. Carefully flip the pears onto the other cut side and cook for an additional 2 minutes. Add the balsamic vinegar and stir to coat the pears. Remove from the heat, allow to cool, then cut the pears into 1-inch pieces. 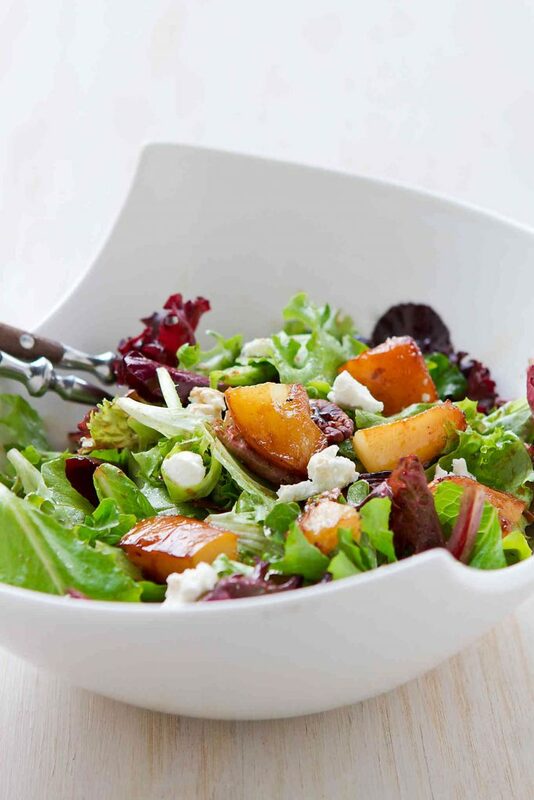 In a serving bowl, combine the mixed greens, browned pears, pecans and goat cheese. Toss with the dressing. Serve. In a small bowl, whisk together the olive oil, vinegar, maple syrup, salt and pepper. 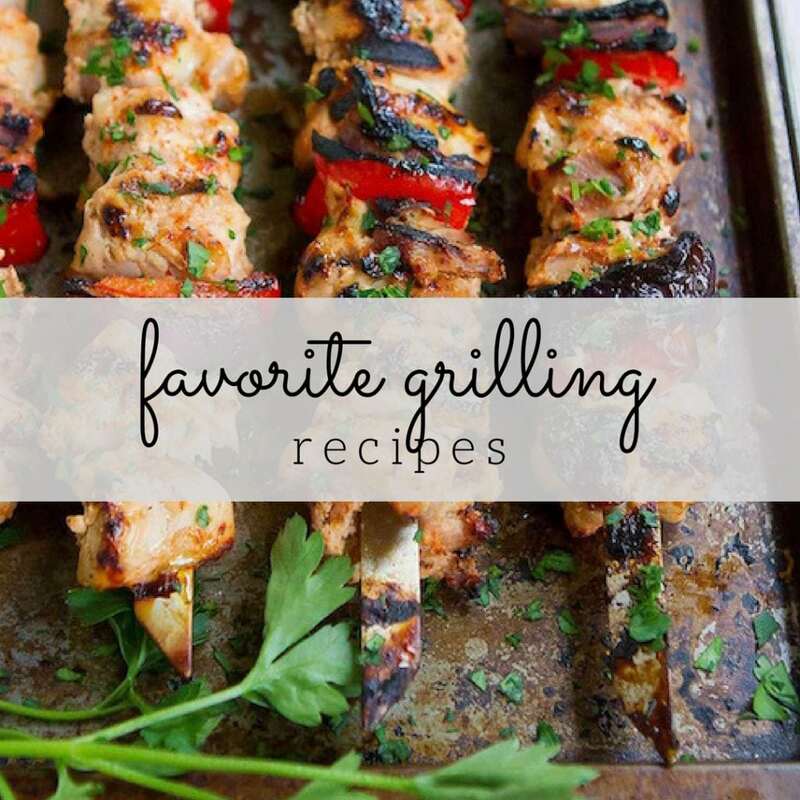 brilliant recipe!!! i’m going to bring this for thanksgiving by adding some cranberries into it. In your directions for the recipe i printed it doesn’t mention when to add the balsamic vinegar when you’re cooking the pears.